Like all humans, IVF doctors too make mistakes sometimes. However, they find it difficult to acknowledge these errors , and this is disturbing. The first response always is to justify or explain it away by laying the blame one someone else like the unsuspecting assistant or nurse. We all need to live with our self-esteems intact; and doctors tend to lave larger than life egos that need protection. This is why they find it an insurmountable task to acknowledge that they are human and can err. 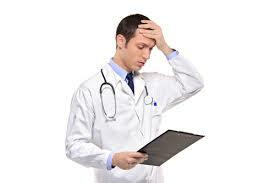 Doctors consider themselves to be an integral part of the helping profession and want their patients to get better. And when to their horror, they realize that they have committed a mistake that has ended up harming their patient; they find it hard to live with this bitter truth. In order to prevent cognitive dissonance, it’s perfectly natural for them to refuse to accept the truth – and even hide the fact from themselves. One of their biggest fears is that their colleagues will think poorly of them; and that they will fall from grace in the eyes of their juniors and staff members. The other distinct worry is that in case their patients find out that an error has been committed, they might take legal action against them in the court of law- the consequences of which can be dire, to say the least. The other fact is that doctors have been brainwashed by their professional liability insurance companies, hospital management professionals, risk management companies and lawyers to never confess to having made an error. Rather than apologize to their patients, they are told to clam up on the matter. This is because lawyers are worried that if doctors are truthful and acknowledge that they have made a mistake, it could be used against them in a court. Doctors are also scared that if they admit to the patient that they have made a mistake, they will lose the trust of their patient and this will create a chasm in the doctor-patient relationship. And so, the knee-jerk reaction that most doctors have in such a situation is to cover up their mistakes; akin to how a child does, rather than face up to them, as a mature adult should. It’s important that doctors learn to be honest and open; not just with patients, but with themselves too. So, even if a mistake occurs, they are able to do something constructive about it. This will go a long way in minimizing the harm caused by the error and they may also be able to take action to prevent this mistake from recurring. This is extremely important, not just for the patient and the healthcare system in general, but for the doctor himself. Trying to cover-up mistakes ends up in creating a major burden of guilt and shame; which can get progressively worse as time goes by! Doctors need to remember that patients can be quite forgiving, and many will accept the fact that honest errors were made. They can forgive their doctor for these – but they will never forgive a doctor for trying to mask these errors under a façade of lies. Noit sure if your IVF doctor has made a mistake ? Please send me your medical details by filling in the form at www.drmalpani.com/free-second-opinion so that I can guide you better !